A great Morgan Housel quote cited by Abnormal Returns points out that passion is not just what we feel, but is expressed in what we do. I wrote my first trading psychology book with no contract in hand from a publisher. It was something I had to write for myself, and I was confident that if I stayed true to my ideas, someone would find the text worthy of publication. Our greatest trading passions reveal themselves when markets are closed. That's when it's clearest that we're engaging in markets for the love of the work, not for the thrill or profit of the trade. When something is a passion, it becomes an intrinsic part of who you are. Like being an artist or an animal lover, you can't turn it on and off between the hours of 9 and 5. It's what you do despite the fact that nothing makes you do it. We find our greatest passions at the intersection of our strengths and interests. Expressing our values and exercising our strengths is intrinsically rewarding; it's what we naturally do without the need for extrinsic motivation. Indeed, if we need to motivate ourselves to get something done, there's a strong likelihood that we're operating outside our values and strengths. An important implication is that we're most likely to succeed in trading if how we trade becomes an expression of who we are. A great example is a trader I worked with who, on his own, was not especially disciplined or diligent. He often did not do the deep dives he knew he needed to do to be successful. When he built a team with junior traders to do the basic research work, he absolutely thrived. He loved managing people and benefited greatly from talking ideas aloud. Once his trading process played to his values of helping others and his strengths of processing information interactively, he became highly engaged and his success expanded exponentially. Your greatest passions have been expressing themselves long before you took up trading. Two of my greatest passions are writing and helping people. There's a reason I've written multiple books, book chapters, journal articles, and blog posts, and there's a reason I became a psychologist--and started helping activities while in high school and college. I love research. As a young child, I used to collect statistics on baseball players and figure out who was best in different categories. Now I collect statistics on markets and figure out opportunity sets. Your path to trading success is to figure out the path you've already been on, the one that you gravitate to naturally. Your trading strengths and passions have existed long before you knew anything about financial markets. The best approach to trading psychology is to figure out who you are and how to harness that in markets--not trying to change yourself to fit a preconceived notion of trading success. 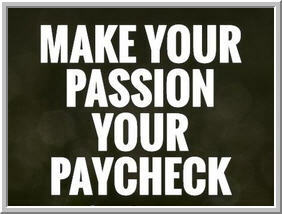 You'll find your greatest success when your passion is your paycheck.